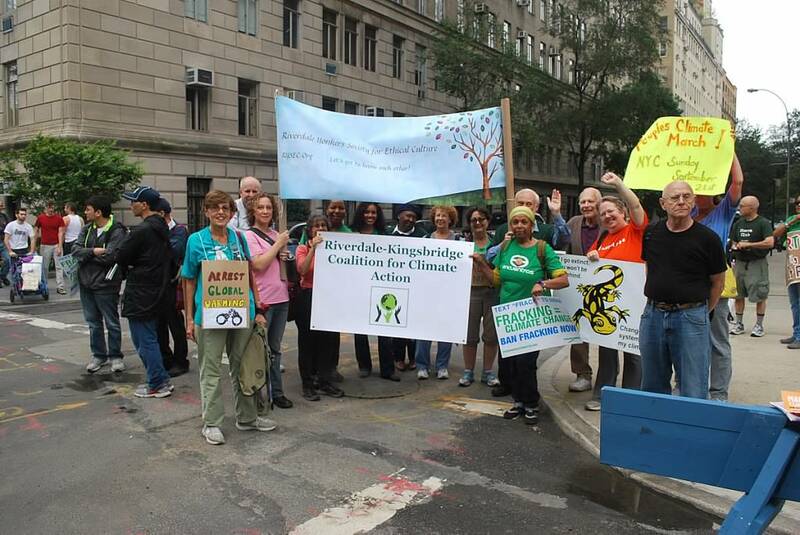 Above: Early in the morning of the historic People’s Climate March, September 21, 2014, the Riverdale-Kingsbridge Coalition for Climate Action (predecessor to BCJN), begins to gather near Columbus Avenue in Manhattan, with friends from Riverdale-Yonkers Society for Ethical Culture. Above: On Sunday, October 19, 2014, members of the Riverdale-Kingsbridge Coalition for Climate Action (predecessor to BCJN), gathered to show their support for a brave band of 30 Pacific Climate Warriors from the Pacific Islands. After 20 fruitless years of lobbying against the fossil fuel industry, which is creating the climate change destroying their island nations, the 30 Pacific Islanders paddled traditional canoes from their islands to the world’s largest coal port in Newcastle, Australia. On Friday, October 17, these courageous people paddled into the path of enormous coal ships coming into and out of the harbor, in a peaceful effort to call attention to the climate-profiteering of the fossil fuel industry. 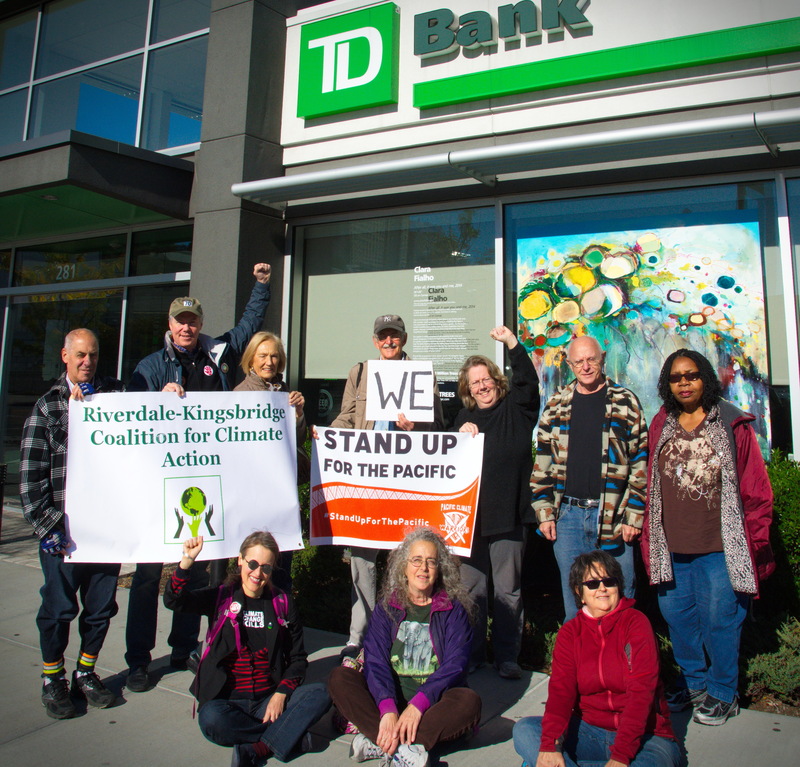 RKCCA gathered for a solidarity photo in front of TD Bank in Kingsbridge. TD Bank is a major shareholder in TransCanada, the fossil fuel company destroying Alberta’s boreal forest in pursuit of tar sands oil. #StandUpForThePacific. Photo: Riverdale Press. Above: BCJN members Robert Schwab, Alicia Grullon (Percent for Green), Mychal Johnson (South Bronx Unite), Taleigh Smith, and Jennifer Scarlott joined with fellow Bronx community activists at The Point Community Development Corp. in Hunts Point to discuss a platform for Bronx Climate Justice on December 12, 2014. 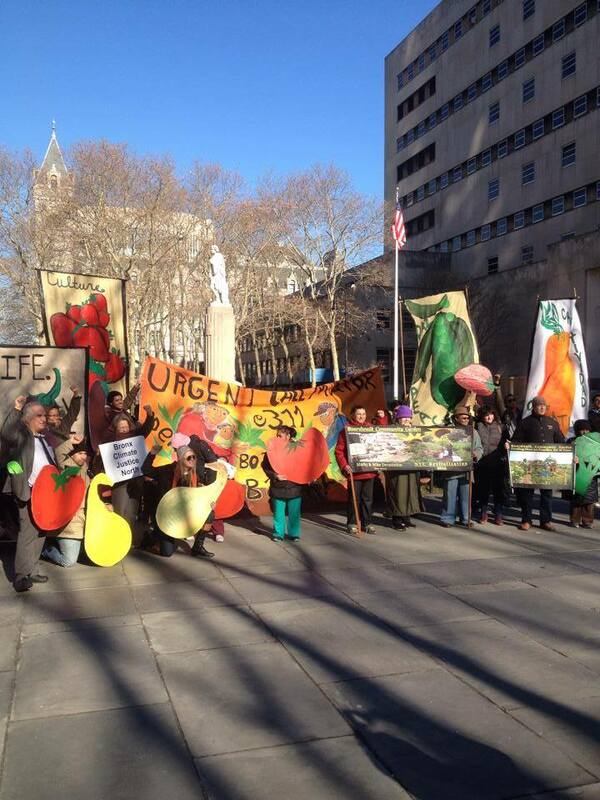 Above: BCJN joins ally New York City Community Garden Coalition and community gardeners and supporters from Coney Island and other parts of NYC outside of Brooklyn State Supreme Court on December 15, 2014. We rallied before packing the court in support of the Boardwalk Community Garden in Coney Island, bulldozed in December 2013, on the last night of the Bloomberg Administration, to make way for a $53 million concrete amphitheater of dubious public value. The magnificent community garden destroyed in 2013 had been vigorously defended by the community and was one of its few open green spaces. It had fed and provided natural medicines for more than 60 local families for nearly 20 years. Above: Protest against the Keystone XL pipeline by NYC climate activists from many organizations including Bronx Climate Justice North, in front of the newly-named Koch Theater (former NY State Theater), on December 21, 2014. 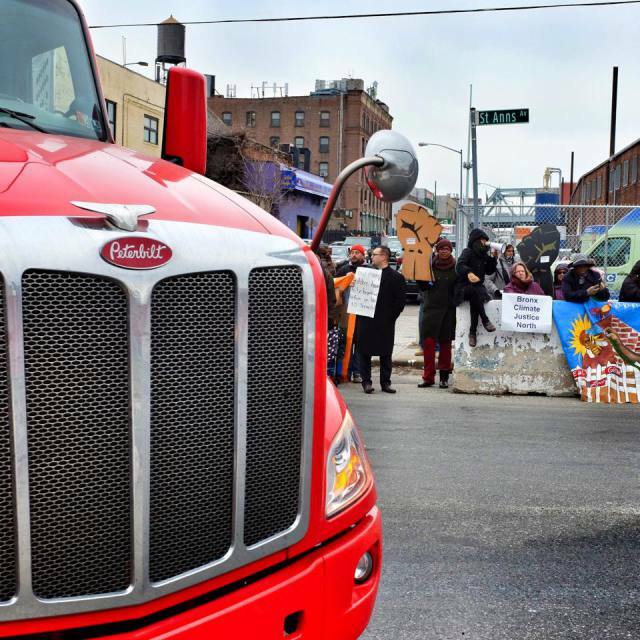 Above: BCJN joins with South Bronx Unite on 12/22/14 outside the gates of the Harlem River Yard, to protest a secret VIP ground-breaking ceremony for a FreshDirect facility that would add 1,000 diesel trucks per day to the neighborhood of the South Bronx long known as Asthma Alley. Above: BCJN joins and testifies at a January 2015 press conference and public hearing on Port Ambrose Liquefied Natural Gas Project at the Marriott Hotel, JFK Airport. 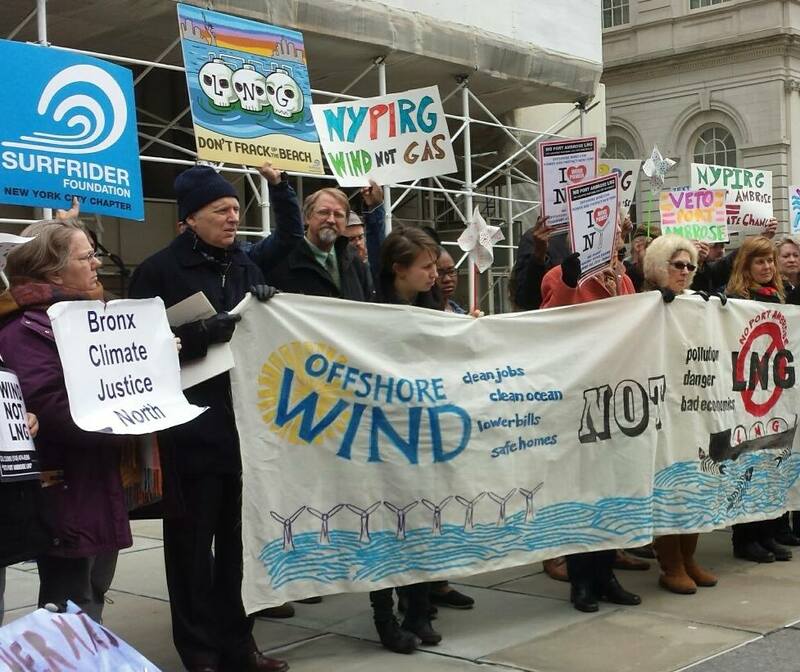 Above: BCJN at a public hearing on the Port Ambrose Liquefied Natural Gas Proposal in Queens in January 2015, and at a Port Ambrose protest and press conference on the steps of New York City Hall in March 2015. 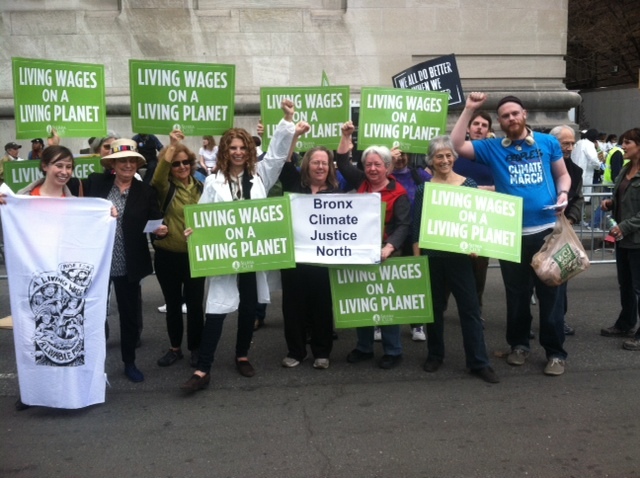 Above: BCJN joins the Fight for $15 Minimum Wage rally and march in Manhattan on April 15, 2015, one of many across the nation on 4/15 (#Fightfor15). 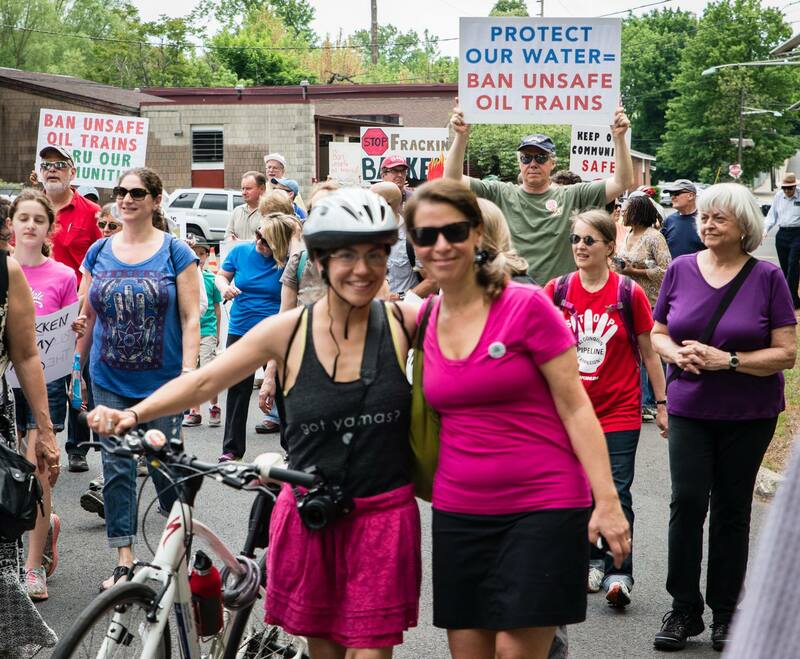 Above: BCJN members Mary Hemings, Martha McClintock, Kevin O’Neill, Emily Peterson, and Jennifer Scarlott participate in the “Danger Zone March and Rally to Ban Unsafe Oil Trains,” organized by 350NJ and the Coalition to Ban Unsafe Oil Trains in Teaneck, NJ, May 17, 2015. BCJN co-sponsored the event. Above: BCJN Coordinator Jennifer Scarlott participated in the two-day, 350.org Mid-Atlantic regional convergence in late July, 2015 in Pennsylvania. BCJN voted to become a 350.org local affiliate in September, 2015. Above: BCJN co-sponsors and participates in Sierra Club NYC Beyond Coal press conference on the steps of NY City Hall, November 23, 2015. Above: On December 12, 2015, the final day of the COP 21 global climate talks in Paris, hundreds of climate activists from New York City and New Jersey, including action co-sponsor Bronx Climate Justice North, drew a red line at the Statue of Liberty, a gift from the people of France to the United States, and a symbol of freedom, hope, and welcome to immigrants. Red-line actions around the world on 12/12/15 declared an end to the fossil fuel era. Above: In early December 2015, Ray Figueroa, President of NYC Community Garden Coalition, visited with BCJN and members of the newly formed Friends of Tibbett’s Tail to discuss the effort to revive a neglected NYC park on Bailey Avenue at 234th St in Kingsbridge, the Bronx. Above: With 10 other activists, BCJN Coordinator Jennifer Scarlott participated in direct action against the AIM pipeline being constructed in Verplanck, NY alongside the Indian Point nuclear power plant. In an early morning action on February 29, 2016, protesters blocked wareyards of the Spectra Energy Corp. In the above photo, the Hudson River is a few hundred yards behind the protesters. Indian Point is less than a quarter mile north. Above: The Spectra Energy work site that was blocked by the Verplanck 11 on the morning of February 29, 2016. The Hudson River, and the 46″ sections of fracked gas pipeline can be clearly seen. Above: The Verplanck 11, photographed immediately after their release from custody by the NY State Police in Cortlandt, NY, on the morning of February 29, 2016. Above: The media interviewing Verplanck 11 defenders outside the Town of Cortlandt Court on April 14, 2016. BCJN Coordinator Jennifer Scarlott is left, foreground. Above: The Verplanck 11 AIM pipeline activists are joined by supporters, including BCJN members Anita Dutt and Mary Hemings, outside the Town of Cortlandt Court, 4/14/16. Above: On the evening of May 13, 2016, BCJN Coordinator Jennifer Scarlott participated in a Hudson River flotilla of kayaks and canoes. The flotilla took to the water near the Port of Albany to announce the next day’s Break Free Albany protest, and to declare our determination to protect the river from crude oil being shipped on bomb trains, barges, and tankers between Albany and New York Harbor. Above: On Saturday, May 14, Break Free Albany continued with a rally followed by a march to block bomb trains on tracks near the Ezra Prentiss Houses. 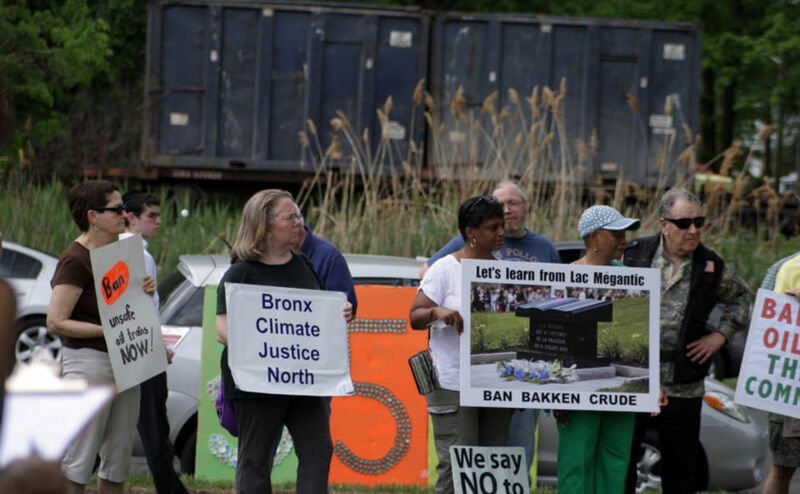 BCJN members Mary Hemings, Robert Schwab, Wayne and Anne Price, Martha McClintock , and Jennifer Scarlott joined thousands of protesters engaging in peaceful civil disobedience on the tracks. Break Free Albany was one of a wave of Break Free actions around the world in mid-May designed to escalate the climate justice movement’s tactics. Above: Occupying the oil bomb tracks in the Port of Albany, Saturday, May 14, as part of Break Free Albany. Above: BCJN hosted a film screening of two documentaries about the struggle for farmworker rights (“Harvest of Shame” and “Harvest of Dignity”) at St. Stephen’s United Methodist Church in Marble Hill on Sunday, May 15, 2016, in preparation for the March for Farmworker Justice the following weekend. Above: BCJN Steering Committee members Jim White and Mary Hemings sit with Reverend Nathaniel Dixon and members of the congregation of St. Stephen’s United Methodist Church at our 6/15/16 farmworker rights film screening. Above: Members of BCJN, the Community Association of Marble Hill, and the Riverdale-Yonkers Society for Ethical Culture come together on Saturday, May 21 to make 200 bag lunches for the March for Farmworker Justice coming through the NW Bronx the following day. Above: Thanks, Diane! You can’t have too many apples to fuel farmworker rights marchers! Above: Before a BCJN rally and lunch in support of the March for Farmworker Justice on Sunday, May 22, BCJN friend and ally Rev. Nathaniel Dixon and his congregation at St. Stephen’s United Methodist Church in Marble Hill gave a loving and profound welcome to the farmworker marchers. Above: Rev. Dixon and his congregation show their support for the March for Farmworker Justice, May 22, 2016, at St. Stephen’s. Above: Pastor Nelson Garcia and the Spanish congregation of Iglesia San Esteban join with Rev. Dixon’s congregation and numerous community supporters of the March for Farmworker Justice outside St. Stephen’s before seeing the March on its way through the NW Bronx and Yonkers to Dobbs Ferry and beyond, 5/22/16. Above: BCJN Coordinator Jennifer Scarlott provides shuttle service to the March for Farmworker Justice during the week beginning May 23. Above: Anthony Del Orbe (far right) of the Community Association of Marble Hill and BCJN joined the 200-mile Long Island to Albany March for Farmworker Justice for the entire distance. Above: Pictured left to right, BCJN and Community Assn. of Marble Hill members Hasan Covington, Lucy Mercado, Ruby Palma, and Anthony Del Orbe provided strong support to the March for Farmworker Justice. They are joined here by dedicated farmworker rights leader Gabriela Quintanilla. Above: BCJN member Jennifer Scarlott with core marcher and farmworker rights activist Librada Paz, on the final day of the March for Farmworker Justice, Albany, June 1, 2016. Above: BCJN members Mary Hemings and Jen Scarlott with a team including BCJN/Community Assn of Marble Hill members Ruby Palma, Hasan Covington, and Anthony Del Orbe on Farmworker Albany Day, June 1, 2016. Here we are waiting to meet with Bronx State Senator Jeffrey Klein and his chief of staff to urge their active support for S. 1291, the Farmworker Fair Labor Practices Act. Above: BCJN members Anthony Del Orbe, Sara Kempton, Robert Schwab, and Alicia Grullon (not pictured) joined others in a “Father’s Day for Mother Earth” clean-up of Tibbett’s Tail Park on Bailey Avenue on Sunday, June 19, 2016. BCJN is an active member of Friends of Tibbett’s Tail, a community organization formed to reclaim this long-neglected park just south of its big sister, Van Cortlandt Park, in the Kingsbridge section of the Bronx. Tibbett’s Tail has great potential as a local green space, community project, and possible community garden. BCJN members Mary Hemings and Jennifer Scarlott gather with supporters and members of the Ramapough Lenape Nation before testifying against harassment by the Township of Mahwah, NJ of the Split Rock Sweetwater Prayer Camp — May 18, 2017. Bronx Climate Justice North organizes “NW Bronx Stands with Charlottesville,” a solidarity vigil after the murderous white supremacy protests in Charlottesvile, VA during the weekend of August 11-13, 2017. Pastor Doug Cunningham of New Day Church addresses the crowd at the corner of W. 231st St & Kingsbridge Avenue in the Kingsbridge section of the Bronx, 8/14/17.